On 11 April 2018 the USS Harry S Truman, a Nimitz-class carrier, departed Naval Station Norfolk in Virginia, USA for a deployment to the US 5th and 6th Fleets Areas of Responsibility, which cover the Middle East and European theatres respectively. Its deployment replaces the USS Theodore Roosevelt and its Carrier Strike Group (CSG) which has been in the area performing operations over Syria and Iraq, as well as strengthening US presence and partnerships. 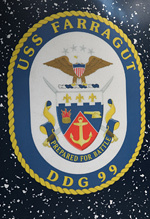 Among the Truman's CSG is the Arleigh Burke-class guided missile destroyer USS Farragut (DDG-99), which visited HMNB Portsmouth on 23-24 April for crew shore time and refueling. 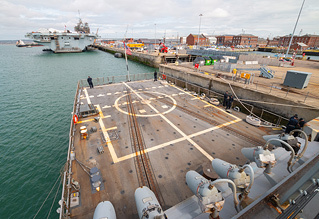 Following on from the visit to the USS George H W Bush last summer, UK Airshow Review visited the Farragut while it was moored in Portsmouth to find out more about the deployment and the role played by the ship in the CSG, as well as to take a look at aviation on board a US Navy destroyer. 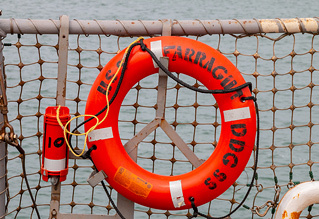 Sam Wise and Rich Pittman visited the USS Farragut and report for UK Airshow Review. Photography by the authors. "The biggest thing we do is provide robust air-defence capability for the carrier in concert with the other ships; that's what the Aegis system is all about. We can do a lot of other stuff too, including ASW [Anti-Submarine Warfare] capability which means we can go hunt and track subs, the other thing is strike capability - the ability to launch cruise missiles at pre-planned targets. When we go through that we train up with the Truman Carrier Strike Group's ships - we've done it with some of the British naval assets that have come over and worked with us on that too. It's primarily about helping defend the carrier and responding to any other tasking that we get directed on by 6th Fleet based out of Naples." Part of this "other tasking" explains why the Farragut has visited Portsmouth and remained in the North Atlantic area while the Truman has headed further south. While the carrier and some of the other group have participated in exercises with Morocco in Exercise Lightning Handshake 2018 and, now, entered the Mediterranean, the Farragut has been sent north as part of a Theater Security Cooperation. "We got carved off to head up north for the Theater Security Cooperation. It's just a chance to go up, work with some of our NATO allies, renew our friendships with them and show the flag if we haven't done that in a bit. We're really just here to get fuel, Portsmouth is a pretty good stop - there's a lot of really good logistics support here. Each navy's got a slightly different culture to it, things like terminology and how you interact with them, so if you don't do it in a steady stream approach every few months you fall out of the habit. All of us are better off than some of us." A Carrier Strike Group is an impressive formation and, with many different ships with different roles involved, it's a huge communications and organisational effort. Build up to the CSG deployment starts months in advance with the Composite Training Unit Exercise (COMPTUEX) which gives both the ship and the CSG operational training across the whole range of roles for the deployment. 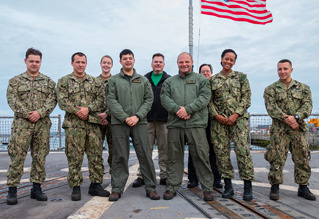 Training for integration with the other ships as well as refreshing and updating the ship's skills takes place about six months before COMPTUEX, after which the ship is certified for the deployment. "The overall command and control for the CSG resides on the carrier but we also train to decentralise some functions as well as switch out some functions from location to location if we need ships to exercise with other countries and roles. So we train to be interchangeable for air defence or surface or anti-submarine warfare and defence. Overall it's built around the carrier but the talking point we say is that we're trained for the whole spectrum of operations. We have to be adaptable. "For our own air traffic the carrier will put out an air plan where they configure air stations to provide a layered defence for the carrier. They tend to control that whereas for us, as an Aegis ship, we have the sensors to provide an overall air picture of what's going on, and we have the ability using the Aegis system to manage situational awareness of civilian vs unidentified vs military air traffic. We have no air control function over civilian aircraft but we are certainly knowledgeable about who's coming in and taking off along the airways. "A lot can happen - weather, accidents, casualties, and you have to be adaptable but it works really well. That's where our training cycles and the muscle memory we develop through integrated exercises comes in. That's also the great benefit of having the NATO ships come in and train with us and learn how carrier ops work when we share the air plans with them." "For me as a captain, it's always the same thing: conduct your operations safely, keep the crew in one piece, keep morale up, give them a chance to go out and see things, and at the same time get the mission done. With the spate of current events and how things are playing out, it's good to just get out and remind people that we're a steady stream, we're not going anywhere, we don't mean anybody any harm. We just like operating with our friends and partners. It's pretty straightforward and that's how we like to operate." After fueling at Portsmouth, the Farragut went on to visit the Baltics, including a stop in the Polish port of Gdynia where the ship hosted local distinguished visitors by way of thanks and appreciation to the country. The ship will eventually join the CSG in the Mediterranean. Naval aviation is inherently challenging from every perspective, but operating off the back of a comparatively small ship like a destroyer brings its own set of difficulties. With very limited hangar space and a flight deck only a handful of metres on each side, the air- and ground-crews involved must work tightly to ensure the success of the detachment's missions. On board the USS Farragut were two MH-60R Seahawks (also known as Romeos) of HSM-72 "Proud Warriors" Combat Element Three. 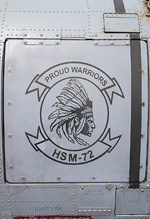 The squadron (HSM - Helicopter Maritime Strike) is part of Carrier Air Wing One, which is assigned to the USS Harry S Truman, and the helicopters and crews are subsequently detached to the Farragut for this deployment. UK Airshow Review spoke to LCdr Adam Shreders, HSM-72 Combat Element Three's Officer in Charge, and LtJG Joey DeLorenzo, helicopter second pilot, about operating off the back of one of the CSG's smaller ships. Despite the small space available to the squadron, the pace of work is remarkable. LCdr Shreders describes the missions being flown: "We're flying three flights a day which amounts to between nine and 10 and a half hours of flight time. 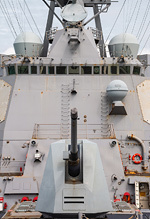 Primary roles are anti-submarine and anti-surface warfare; typically that means what we call a forward screen, where we fly at a set distance in front of the fleet or ship working on what's referred to as a Recognised Maritime Picture - what's going on in the world and what, if anything, might affect the strike group's or ship's operations. For ASW our primary piece of mission systems is the Airborne Low-Frequency Sonar, which is a dipping sonar or "dipper". It's an active sonar which we use to detect, track and classify submarines." This busy schedule means that the ship carries three aircrews on board, taking turns in an eight-hour cycle. Crews will generally fly more than one mission a day, but when they're not flying they're still in an alert status ready to launch on MEDEVAC missions or reactionary tasking. The pilots and aircrews are trained to fly in almost all conditions, and fortunately the helicopter supports them: "The dynamic nature of shipboard environment means the mission can change from the brief, even in flight, and given the multi-mode nature of the Romeo it's a requisite and an expectation that you will be able to flex as needed. The MH-60R represents a big upgrade from the previous system, the SH-60B Legacy Seahawk. It is an all-weather and all-sea-state helicopter, so unless we're taking water over the flight deck we'll fly in all conditions, night and day." Surprisingly, landing on such a small area isn't actually the hard part, as LtJG DeLorenzo explains: "It's not all that difficult. Luckily we've got all these flight deck markings to help us get our alignment and figure out our situation. Really it all depends on sea state for how hard it is to land but it's like riding a bike - once you learn how to do it and keep going back to it it's not that difficult. When we come in we typically request multiple approaches to keep up practice and deck landing qualifications." 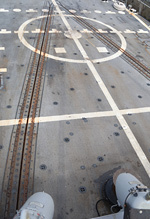 The ship uses a Rapid Securing Device (RSD) to secure the landing helicopter - it is a computer-controlled 1m by 1m trap which traverses across the deck to move the helicopter into and out of the hangar as well as to secure it to the deck in rougher seas. The pilots hover above it and have to align a probe under the helicopter with the trap. A heavy schedule like this naturally puts demand on the helicopters and the aircrews are, of course, accompanied by the men and women who keep the machines running on the ground as well. They bring with them a huge amount of stores and spares to keep the helicopters flying - for all intents and purposes they have a full overhaul facility on board the ships, with the groundcrews able to change engines, transmissions, rotorblades while underway at sea. Working on CruDes (Cruiser/Destroyer) ships does not inhibit aircraft maintenance and with enough spares on board there is no reason they can't always have an "up aircraft" - a helicopter ready to go at any time. Aside from the US Navy's normal logistical chains, the crew is also able to simply fly to the carrier and pick up what they need (this isn't an option when the ship is on individual operations, of course). 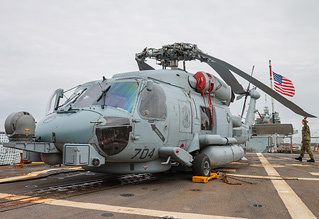 One of the MH-60Rs on board the Farragut was virtually brand new, with fewer than 150 hours flight time, so the detachment to the Farragut is happy that they are flying with the latest and most competent equipment available to them. The biggest challenge facing helicopter detachments on a CruDes ship is the limited hangar space. As with most naval aircraft the MH-60R is able to fold sections of the airframe in order to take up less space - this is a semi-manual effort as the tail section and horizontal stabilisers are stowed by hand. The stowing process takes less than ten minutes from start to finish, a remarkable achievement on a potentially blustery and swaying flight deck. Even so, once the helicopter is inside the ship there is very little room to work around it. LCdr Shreders enjoys being on the smaller ships, however: "The limited maintenance facilities are the biggest challenge and it's certainly easier to operate off the carrier where there's more space. I actually prefer it on a cruiser or destroyer though, and on the Farragut we have a great crew who are very easy to integrate with." The crews place good stock in their training systems and professionalism to keep their aircraft flying, and in doing so, are confident of delivering successful missions 24 hours a day for the ship and Strike Group for the upcoming deployment. UKAR would like to thank Jennifer Williams at the US Embassy in London, Lt Frederick Middlebrooks at US 6th Fleet and Lt Ben Clede and Ens Merrillee Palmer at the USS Farragut for their assistance in putting together this feature.